Safely support heavy trailers with this industrial-duty jack. 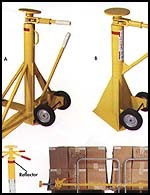 Lifting capacity is 40,000 lbs., static capacity is 80,000 lbs. Durable two-way ratchet has a 2" dia. screw. Usable range varies from 39" to 51". Oversize base measures 27"W x 48"L. 8" dia. top cap for even load distribution. Rolls on 8" semi-pneumatic wheels. Safety Yellow in color. Meets OSHA requirements.